Labor Secretary Eyed As White House Searches To Replace Attorney General : It's All Politics The White House effort to replace Attorney General Eric Holder is happening largely in the shadows. 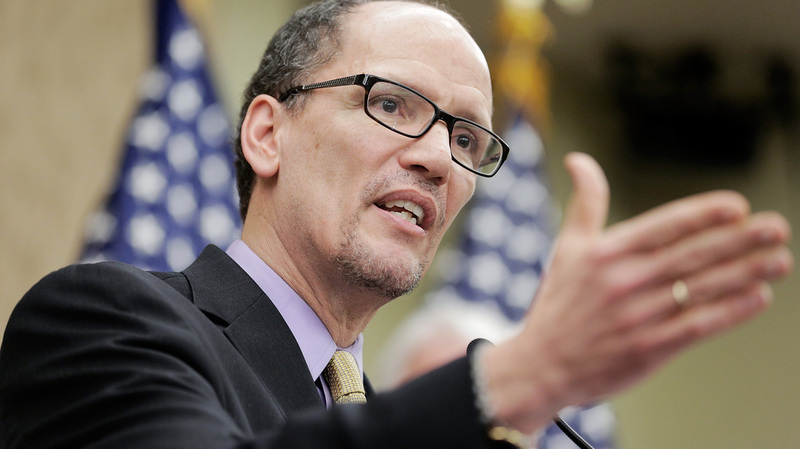 But Labor Secretary Thomas Perez is emerging as a top candidate for the post. Secretary of Labor Thomas Perez is a top candidate to be the next attorney general, according to sources familiar with the process. NPR has learned Labor Secretary Thomas Perez is a top candidate to be the next attorney general. Three sources familiar with the process say the issue is on the desk of President Obama, who has yet to decide among a relatively short list of options. White House spokesman Eric Schultz said in an email Friday that "we have no personnel announcements at this time." Perez ran the civil rights unit at the Justice Department earlier in the Obama administration, where, as one of the most aggressive civil rights enforcers in recent history, he investigated record numbers of police departments and helped enforce the Matthew Shepard and James Byrd Jr. Hate Crimes Prevention Act. Other possibilities to replace Attorney General Eric Holder, who announced his intention to resign two weeks ago, include current and former U.S. attorneys and justice officials. The White House doesn't have a great deal of wiggle room if it wants to confirm Holder's successor before the end of the year. With midterm elections approaching, political sensitivities are high. And to get a nominee through during the Senate's lame-duck session, the administration would need to act soon because of paperwork and background check requirements, as well as procedural delays the GOP could deploy.